Principles fixed in basis configuration development of the BURAN orbiter are stated. Development stages and their features are listed. It is shown that configuration creation is a consecutive realization of the technical requirements to the orbiter. BURAN manned reusable orbital spaceship (orbiter) configuration (its appearance, shape, airframe units and modules mutual layout and onboard systems elements, units and blocks installed in it) is a practical realization of the technical requirements to the orbiter taking into account technological stages uniqueness of its use. orbiter reusable ability with time and means minimization spared on service and first of all when returning from artificial Earth satellite orbit to space port airdrome. technological, repair and other works on the ground. The results of analysis of technical requirements to orbiter and uniqueness of its operating stages have predetermined multilevel character of orbiter configuration development. equipment, modules and devices placement. Orbiter configuration development process is for sure of interactive type. But at each stage previous stage general requirements absolute fulfillment with conditions and limitation production at the next stage is provided. The fact that the orbiter must return to the Earth and land on an airdrome (situated at 2000 km distance from de-orbital plane) like any other airplane had the final influence on its shape choice. The orbiter must perform a controlled gliding descent in the atmosphere breaking from circular velocity to landing speed. When doing this, the orbiter must be dynamically balanced and controlled at hypersonic, supersonic, transonic and subsonic speeds. Such the requirement determined the plane appearance of BURAN orbiter, i.e. wing and vertical tail, its shape and airfoil, mutual wing and fuselage placement, aerodynamic control and breaking equipment, heat shield placement etc. At the same time taking into account construction strength, heat shield and heat isolator durable and thermal-physical characteristics, specialists were able to define minimal radiuses of fuselage forebody, a wing and vertical tail. The requirements to movable elements of construction (elevons, balancing flap etc) were also defined. 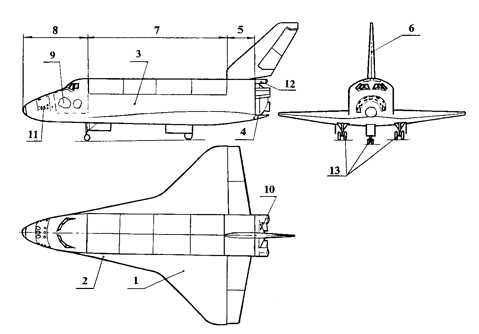 As you can see (see picture), BURAN orbiter is a tailless airplane, low-wing monoplane with small span-chord ratio and large swept-back airfoil (1), with leading-edge extension (2) from front wing edge (1) to fuselage (3), with vertical tail (6) and with balancing flap (4) fixed at the fuselage rear (5). Balancing requirements in all the range of flight velocities are provided both by orbiter body aerodynamic features and by center mass position on all the flight stages. Aerodynamic characteristics are also provided by leading-edge extension (2), fuselage tail(6), balancing flap (4) etc. Z = ± 16 mm from surface symmetry. These limits were provided by layout decisions on the last design stages. In order to control orbiter during the flight in atmosphere the wing (1) is equipped with elevons, vertical tail (6) with breakup rudder that can function as an air break. At the second stage of configuration development when determining units’ mutual placement, geometry characteristics and fuselage appearance the problems (huge cargo transportation and returning back taking into account orbiter working on the orbit) going from orbiter main aims were solved. BURAN orbiter was to meet the requirement of flight at descent and landing both without cargo and with cargo (15 tons for normal and up to 30 tons for abnormal flight). That requirement was combined with cargo huge size (up to 17.0 m length and 4.5 m diameter) and center mass range control requirements at any stage of the flight. All these made it clear that cargo bay (7) must be at fuselage middle (3). Payload bay (PLB) is equipped with folds that made possible load (unload) of payloads both on the ground and in the orbit. The requirements to the orbiter as to any controlled airplane determined its fuselage forebody appearance (8) taking into account crew cabin (9) and cabin canopy. In order to reduce acoustic and heat influence on the crew and to control the airframe air-tightness, the cabin (9) is done autonomous and fixed on fuselage forebody with the use of special pods. rear part (5) with vertical tail (6) where Orbital Maneuvering System (OMS) engines (10) are installed. Outer fuselage dimensions were first of all determined by expected maximum cargo size, design dynamic gaps between the cargo and PLB module construction, PLB construction height and heat shield thickness. At the same time wing’s placement like any low-wing monoplane determined structure power construction of the center-wing (up to 1500 mm height in the orbiter’s symmetry surface) under the PLB module. optimized wing thickness and profile form choice taking into account both subsonic flight (landing) and front edges minimum permissible radius, found by heat calculation. When choosing the maximum wing thickness we should take into account that undercarriage must be installed there. Fuselage cross-section size depended also on cabin size and configuration. Its minimization must not influence on crew workability and comfortable occupancy. In general, the first two configuration development stages determined fuselage, wing, vertical tail and balancing flap size and shape choice with exact estimation of the takeoff and landing weight. The mass summary calculations are confirmed by data from co-developing companies and organizations. Together with them onboard systems characteristics are defined including mass-geometric parameters for all the modules and units’. The third stage (blocks, equipment, devices and system installation in different modules) is done when all modules’ sizes are defined and orbiter center mass permissible dispersal is affirmed. repair-ability and orbiter different systems and units’ easy access for time and labour reduce during service works. During this stage some parameters can be made more specific (such as fuselage forebody lines depending on cabin module geometry, rear module elements, scheme of load carrying for the airframe modules and units etc). Such level work on configuration (layout) is multi directional and requires much labour input. Units’ installation density is so high that it becomes impossible to find out every unit exact placement not paying attention to other units. Every change in configuration (layout) reflects on orbiter airframe and systems mass and of course on mass center placement. For example, it was found out that power users and cables mass can change for more than 500 kg depending on their mutual placement. We can say that questions of technological processes and orbiter service begin to be solved when modules, blocks, units, devices and structure layout, linking cables and pipelines laying are developed. Among these processes are the problems of easy access to equipment during assembling and at the inter flight maintenance. The scheme shown on the picture explains general decisions made on BURAN appearance. In the fuselage forebody (8) in front of cabin (9) the Reaction Control System (RCS) forebody engines block (11) is installed. In order to improve its operating characteristics the block is situated on load-carrying construction, which is fastened to fuselage forebody panel. The block is removed from orbiter together with the panel when in service. Crew cabin module (9) is one the most important parts of the orbiter. Besides the crew and life-support system, blocks and systems of the onboard avionics are situated in it. This equipment is connected by information systems with all other systems in different modules. In the fuselage middle part (7) under PLB module electricity supply and fire fighting blocks and systems are installed. On PLB rear wall telescopic high-directional antenna is installed. Orbiter thermostatic control system radiators are situated on PLB folds. Orbital Maneuvering System (OMS) general block (10), Auxiliary Power Unit (APU), air-tightness device module and other systems and units are installed in the fuselage rear part (5). Two rear blocks of RCS and braking parachute container (12) are fixed to the fuselage rear part. Orbiter landing gear is a traditional thrice undercarriage (13). Controlled folds of orbiter airframe ventilation and pressurization systems are installed on the fuselage lateral walls. Orbiter configuration working process united the efforts of orbiter systems co-developers organizations. Between uniting and controlling efficiency criteria, the airframe and systems limited mass summary was prepared in 1976. When preparing the orbiter first flight (1988) it was found out that the real mass of the spaceship differed from the limited one only by 6%. Requirements to permissible center mass range dispersal were also satisfied. This achievement is a result of right and strong management on design process at its every stage. This also tells us about high professionalism of the specialists from NPO MOLNIYA. The experience, received while BURAN orbiter configuration development, was later used by the specialists during their work on future aerospace transport systems such as MAKS on the base of AN-225 carrier-plane. At head of BURAN orbiter configuration development was Mr. Selitsky Ya.I. (Deputy Head Designer). Mr. Ivanov S.A., Krasikov A.I., Sharapov A.I., Govor I.S., Markov A.P., Mrs. Snopkova N.A., Mr. Katsubo N.I., Solomatin A.S., Mamin V.V., Kudyakov V.E., Zinkovsky I.G. and others took active part in the work.